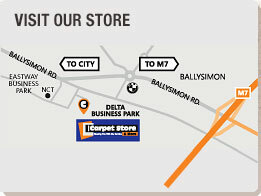 The Carpet Store and More is easily found in Delta Retail Park on the Ballysimon Road in Limerick, beside Soundstore and Delta Adventure City. There is ample free parking so drop in anytime. we are open 7 days a week so we’ll be there when you call.